Join Science Partners as we tour of St. Augustine, our nation's oldest city. Our day begins at the Fountain of Youth, a National Archaeological Park. 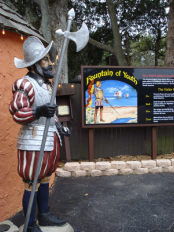 The park is located at the site of the ancient Timucuan Indian town of Seloy. This is where the history of North American began when Ponce de Leon came ashore and claimed ALL of North America for Spain. At that time, "La Florida" was the entire North American continent, not just our state! Our group will tour the Springhouse where we can sample water from the spring that Ponce de Leon thought was the Fountain of Youth. We'll also see the Explorer's Discovery Globe show, Navigator’s Planetarium, Timucuan Indian village, other exhibits, the grounds, and gift shop. Then we're off for the Old Florida Museum where we will be divided into groups. Depending on our numbers and availability, we may be Indians, Spanish, or Pioneers. (Minimum number per group is 15 students and adults.) 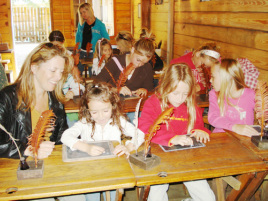 Students will enjoy an “entertaining and educational experience designed to expose them to daily living skills of the Timucuan Indians, the Spanish Fort Mose inhabitants, and Florida pioneer children.” We’ll eat lunch at Old Florida Museum’s picnic area. Afterwards, we'll head downtown to St. Augustine’s historical district. We will meet at the St. Augustine Visitor Center and spend two hours in the downtown historic area. At Castillo de San Marcos, we will spend an hour exploring 300 years of Florida history during a guided tour of this unique national monument. We will also explore historic St. George Street where we will have an opportunity to step back in time on this narrow, paved brick street to see the Huguenot Cemetery, the City Gate, the Oldest Wooden Schoolhouse in the USA, and more. We'll have some free time along this historic street. Our day as a group ends at approximately 3:00 PM. Minimum age: 4 years old recommended (however, 3 years and under may attend). Cost: $29 for 4-15 years and $39 for 16 years and over. Creation Adventures may be scheduled any day of the week, Monday through Friday. Friday is generally the busiest day of the week for school groups in St. Augustine. To visit our website calendar and check for available dates or currently scheduled adventures, click here. See info about our last St. Augustine - Florida History Tour field trip on Saturday, Dec. 2, 2017.